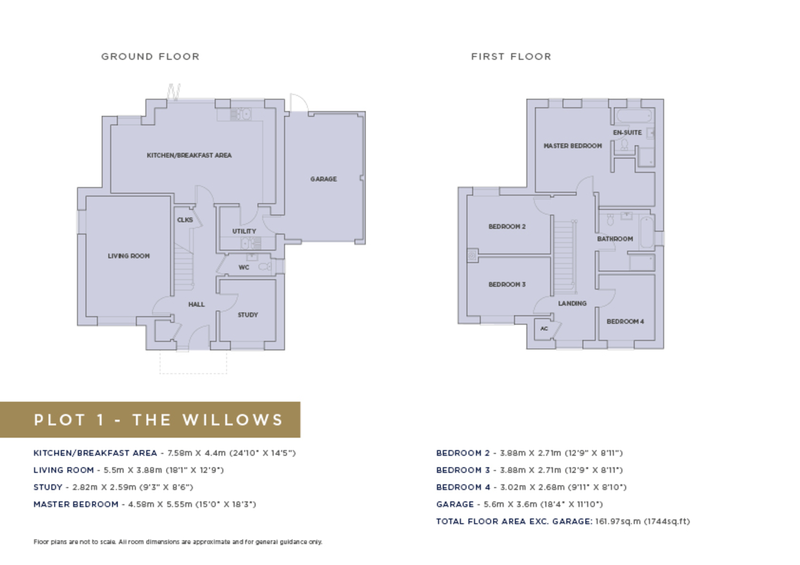 Meadow View is an exclusive collection of five exceptionally appointed four and five bedroomed family homes. Meadow View is an exclusive collection of five exceptionally appointed five and four bedroomed family homes. Each Cubed Homes' property is built with close attention to every detail and comes with an array of features. All properties are backed with a 10 Year Warranty by Build Zone. KITCHEN/BREAKFAST AREA & UTILITY ROOM:  The kitchen is equipped with a range of Crown Zeluso wall and floor cabinets, and island unit, all with solid quartz worktops and upstands.  Carron stainless steel under mounted sink with Franke chrome tap.  Fully integrated NEFF appliances to include 5 ring gas hob, twin hide and slide ovens, extractor hood, full height fridge, dishwasher and Caple wine cooler.  Porcelain floor tiles to kitchen/breakfast area and utility room.  Utility room with range of quality base units, solid quartz worktops and upstands, stainless steel sink, integrated full height freezer and space for washing machine and tumble dryer. BATHROOM, EN-SUITES & CLOAKROOM:  Luxurious white bathroom suites by Twyfords with contemporary Grohe chrome fittings.  Heated chrome towel rails provided to the bathroom and en-suites.  Mirror and shaver socket to the bathroom and en-suites.  Porcelain wall and floor tiles to the bathroom, en-suites and cloakroom. ENTRANCE HALL:  Porcelain floor tiles to entrance hall. ELECTRICAL & MULTIMEDIA:  LED downlighters provided to the hall, kitchen/breakfast area, utility room, study, all bathrooms and en-suites. Pendant light provided to all other rooms.  TV/Sat and BT/Data points are provided to the living room with a provision for Sky HD (box, dish and subscription not included). Further data points, wired back to a central point, provided in the kitchen/breakfast area and all bedrooms. HEATING & HOT WATER:  Energy efficient gas-fired central heating system, via underfloor heating to the ground floor and radiators with thermostatic controls to the upper floors. Hot water is provided via a pressurised hot water cylinder. PEACE OF MIND:  Wiring for an alarm system is provided to the house.  All windows and external doors with multi point locking system.  External lighting provided to all the external doors.  Mains smoke alarm fitted to the hall and landing.  Mains heat detector provided to the kitchen/breakfast area and carbon monoxide detectors provided close to the boiler and in the living room. FINISHING TOUCHES:  Aluminium panelled front door and quality double glazed aluminium framed windows.  Aluminium framed folding/sliding doors where provided.  High quality veneered oak internal doors with chrome fittings.  Flue system built in ready to accept a wood burning stove (to the Beaches, the Laurels and the Willows).  Oak beamed/face brick fire surround with flue system ready to accept wood burning stove to the Yew Tree House and Oakhurst House.  Bespoke locally made staircase with oak handrail, and glass infill panels.  Loft hatch with ladder. EXTERNAL FEATURES:  Paved driveways.  Timber fencing to boundaries/nature hedging where appropriate.  Patio area in Indian sandstone.  Garaging with power and lighting plus remote control electrically operated 'up and over' doors.  Handmade clay roof tiles/slates dependent upon property. TENURE AND SERVICES:  Freehold.